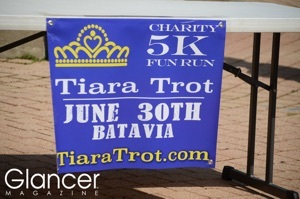 Tiara Trot a HUGE Success! Thanks to our generous sponsors and community members that came to the event, we will be able to donate over $1,000 to Victoria’s Voice - the nationally recognized platform of the Mrs. America Pageant (www.victoriasiegelfoundation.org)! addiction, and overdose death through prevention, treatment, and recovery research and efforts. Nicole also prayed for those currently suffering or recovering, as well as for a safe event, and sang the National Anthem! The 5k Run/Walk started promptly at 10am and the first place male and female finishers were crowned the winners with a crown or tiara! also present to cover the event, so keep a lookout for a feature in next month’s magazine! We hope it will be an annual event!